I was born and raised in my hometown Laoac in the province of Pangasinan. Not a lot of people know this town because it's considered as the youngest town of Pangasinan. Laoac used to be a barangay of Manaoag but it was converted into a town on March 5, 1980 by virtue of a Republic Act. The Municipality of Laoac got it's name when the first Ilocano settlers arrived in the late 1800’s. They were greatly astonished by the immense, flat terrain with lush vegetation, and one of them loudly exclaimed in his native tongue, “Nag’la’oa daytoy nga tay-aken!” In English it means, “How wide this plain is!” The Ilocano word “laoa” means “wide” and that's how the Municipality of Laoac got its name. I graduated in Laoac Central School and I got my first job in the municipality of Laoac after I graduated from college. Then I landed a job at Laoac National High School and worked there for 7 and a half years before I migrated to the US. I love my birthplace and I'm proud to be a Lawakenian. It's about time to feature my town here in my blog. We're celebrating our 34th fiesta now and it commemorated yesterday and will end on the 5th of this month. So yesterday my friend and I agreed to take some pics in front of the town hall. It's just a walking distance from our house, about 5 minutes walk but I asked hubby to drive me there and then he left when my friend arrived. He's not very fond of taking pics, unlike me, lol! Here are pics at the back of the town hall. Then we proceeded to the Agro-Industrial Trade Fare 2014. This is the first time that they held this event. The participating barangays built nipa huts where they sell their produce from their respective barangays like veggies, fruits, plants, candies, crafts, etc. They will chose a winner of the best hut who will receive 20k. wow, I enjoyed the virtual tour. I have not been to your hometown but it looks like it's worth visiting! I wish I can visit your place one day. It looks so beautiful. you look so happy and contented on your pictures, i believe there is no place like home that's why no matter how far we are from it, we always go back to remember the memories we built into that place. You are blooming in pink Manang. Those bakyas look cute. I haven't worn one in ages. You have beautiful and clean hometown. I never visit in the area yet. Looks like a very nice town. I enjoyed viewing your smiles inside those nipa huts and the giant "bakya" looks so cute!!! oh wow, love that shot of you with the "bakya" the most, gives me really very fond memories of that famous foot wear. Love your smiles. happy anniversary to your hometown, may you have a festive celebration over there. i have been to Manaoag once and wish to go back again one day. beautiful pictures as always. Your two looks beautiful and peaceful. I have never been to any place in Pangasinan. You really proud of your hometown and you deserved it for a long time. The birthplace is the most memorable one when you attached your heart into it. You live in a beautiful town :-) You make me missed my home town as well :-( I bet the air is fresh in your town. It's always great to be HOME, it's where your HEART will always be. 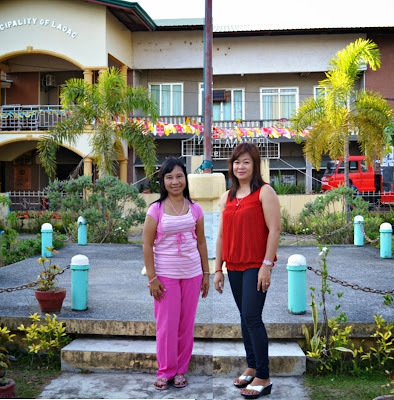 The photos just show how happy and proud you are to feature Laoac, your beloved hometown. Your hometown is such lovely. It would be great to visit there.